On its first day of General Availability .WEBCAM got more than 3,500 domain name registrations. 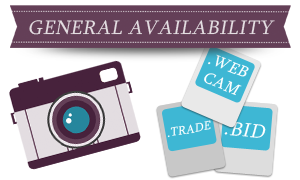 Three additional new gTLDs have just become available for registration by the general public: .WEBCAM, .TRADE and .BID with the first two sparking most interest among Internet users. After two days of general availability, there are about 3,700 .WEBCAM domain registrations, .TRADE has about 3,400 registered domain names and .BID has about 340 registrations. These numbers include Sunrise phase registrations and registry-owned domain names. If you are interested in registering a domain name within .WEBCAM, .TRADE or .BID extensions or any other domains, please click on the domain to get more information. For assistance, please contact our Support Team at support@web-solutions.eu or via phone on +44 (0) 208 133 3994.